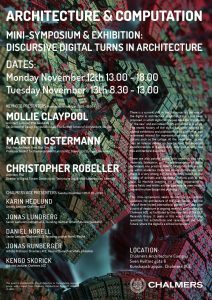 12.11.2018, Gothenburg: Christopher Robeller will be giving a Keynote Lecture at the Architecture and Computation event at Chalmers University of Technology in Gothenburg, Sweden. Welcome to a mini-symposium that will explore the most vibrant paths for near future research within Architecture and the Digital. Three invited international keynotes speakers will be introduce their research and practice, followed by presentations from the Architecture & Computation faculty of Chalmers ACE. The event is free. The digital is present within architectural practice, research and education in parallel ways. Robotic fabrication labs are set up within academia, there are annual conferences, and there is a very strong on-line community based on the sharing of skillsets and knowledge. There is research into new materials, fabrication, and the implementation of digital techniques into practice. Notions such as big data, AI, Machine Learning are gaining importance in many fields, within architecture maybe so far mostly present in urban design and planning. At the same time, there is a current shift in the discourses on the role of the digital in architecture. A post-digital era has been proposed, in which digital techniques have lost the allure of “the new” and are instead firmly embedded in the discipline. The recent history of the digital has been covered in several exhibitions and publications as a past-tense, and a renewed interest for representation sees a return of notions such as the collage. Society sees an intense debate on how to meet the expected transformations of digitalization, often not directly tied into architectural discourse. This mini-symposium seeks to identify key critical questions for architecture of the near future, with the help of three invited international guests. It will also take a point of departure in ongoing research and teaching at Chalmers ACE, as facilitated by the members of the Architecture & Computation Research Group. It seeks in this way to identify key questions for architecture and research of the near future, where the digital is a critical component. The event will be accompanied by an exhibition presenting an overview of student work, research and practice associated to the research group.